1. Make the crust: Heat oven to 400°. Stir butter, water, oil, sugar, and salt in a small saucepan over medium low heat until butter is bubbling and lightly brown at edges, about 10-15 minutes. 2. Remove from oven and stir in flour until dough comes together. Press dough into bottom and up sides of five 4 tart pans (or one large 9 tart). Using a fork, prick dough all over. 3. Bake until cooked through, 8-10 minutes; let cool. 4. Make the filling: Whisk sugar, cornstarch, vanilla bean scrapings, pod, salt, and yolks in a 4-qt. saucepan until smooth. 5. Stir in milk and place over medium heat; cook, stirring constantly, until thickened, about 10 minutes. 6. Remove from heat and slowly whisk in butter until smooth; and transfer to a bowl. Cover with plastic wrap, pressing it directly on the surface of the pastry cream; chill until set, at least 2 hours. 7. 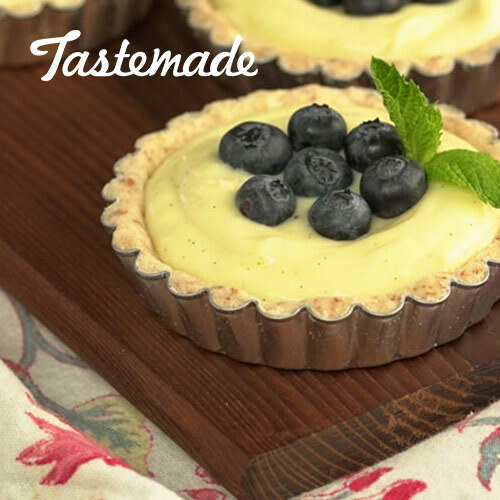 To serve, spread pastry cream evenly over tart shells and garnish with blueberries. 8. Chill tarts until ready to serve.